Uh oh…that Lydia…she’s created a monster! Now that I’ve started with the Mix-Ability Challenge over at Splitcoast…I can’t stop! LOL! Here’s one more for today…mixing matte with shine. See my previous post for the link to this fabulous new challenge at Splitcoast! 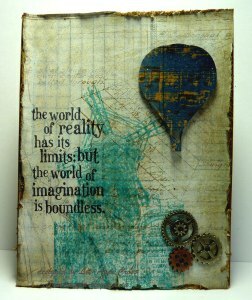 This card started out with a piece of Tim Holtz Paper Stash – Kraft Resist. It’s been coated with Picket Fence Distress Stain before starting to stamp. What I love about this medium is once it gets to the opacity I want, I dry it with my heat gun. Next I stamped a few images in the background with Brushed Corduroy Distress Ink. Then I added another coat of Picket Fence. Next, I heat embossed the windmill image. The sentiment has been stamped in Ranger Archival Jet Black. I die cut the hot air balloon out of another piece of the kraft resist and inked it with Chipped Sapphire Distress Stain. And finally, for a little more shine against the matte background…three little gears. Of course, it had to be distressed, so I distressed all the edges with my distressing tool and inked it with Walnut Stain Distress Ink. Hope this has inspired you to try something new!